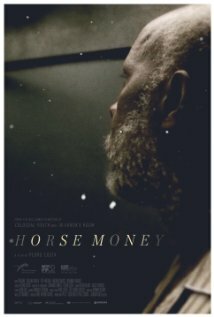 Movie Review: “Horse Money” is the new drama from the celebrated Portuguese filmmaker, Pedro Costa, author of the remarkable trilogy based in Fontainhas, an impoverished neighborhood in Lisbon, which includes “Ossos”, “In Vanda’s Room”, and “Colossal Youth”. This time the subject is a bit different, but Mr. Costa retrieves Ventura from his last film. This man, played by himself, is a confused Cape Verdean immigrant, a retired bricklayer, who was admitted in a Lisbon’s hospital where he keeps escaping through the gloomy back passageways, losing track of the space and the time, and being haunted by ghostly presences of his past. To complement the disquieting phantasmagoric images, we’re granted part of the disorder that goes on Ventura’s head. These particular sequences are arranged with a persistent exactitude, and yet some elements seem not to fit quite well, making us even more intrigued and sometimes lost in the darkness of his alienation. Suffering from a nervous condition, Ventura is stuck in time – he says he’s 19 and believes the date is March 11, 1975, time of a failed military coup led by General Spínola. This occurrence apparently destroyed the company where Ventura was working. In one of his visits to what remains of this company, Ventura finds his nephew, who seems a ghost waiting for the money that was never paid after a three-month absence due to an epileptic seizure. He often bumps into Vitalina Varela, an anguished widow, who blames Ventura for the death of her husband. Another visitor is a man who stabbed him and whose restless soul also wanders throughout the hospital. The most memorable scene is when Ventura is tormented by voices inside the hospital’s elevator, in the presence of a living statue of a revolutionary soldier. Costa brilliantly plays with past and present, truth and hallucination, desires and nightmares, songs and silences, politics and misery, life, death… My head is still spinning in a sort of a watchful dazzle, and I cannot forget the sad, vague, and embittered expressions of these lost souls…or ghosts.